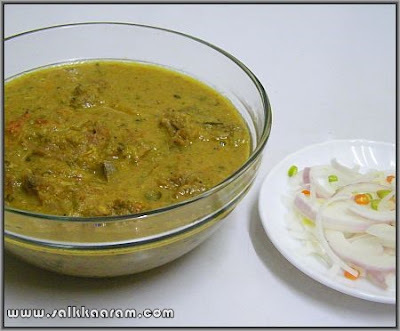 Mutton Kurma / Mutton Korma | Simple and Delicious ! Grind by adding enough water and keep aside. Heat oil, saute onion until transparent and slightly brown. Add ground garlic, ginger , green-chillies with finely chopped tomatoes. Add little salt and stir until the tomatoes are cooked and mashed. Put potato pieces, mutton, all the powders and chopped mint leaves, coriander leaves and curry leaves into this. Check salt and add enough. Add little water enough to cook, and cook until the mutton is done. Approximately 4 or 6 whistles needed to pressure cook. Allow to cool, open pressure cooker, pour the ground paste and boil. (Add little water if needed to adjust the consistency). Serve hot with ghee rice or porota, or chapati.! 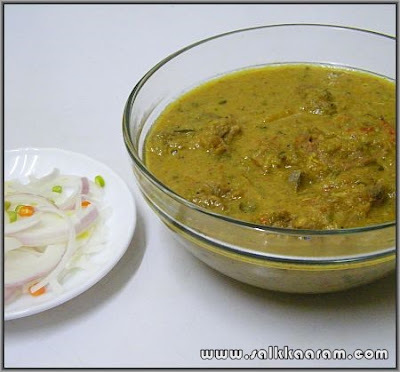 We don't get mutton here , which i think is so pity, but i think i will make this with chicken one day.